A federal judge has dismissed class action allegations from a lawsuit filed against the makers of Pradaxa. This does not mean that you no longer have a pending or potential case. The individual claims for injuries will be allowed to continue; claims that allege that Boehringer Ingelheim failed to adequately warn about the risk of bleeding from side effects of Pradaxa. The judge who dismissed the class action allegations is currently presiding over more than 1,100 Pradaxa lawsuits that have been filed in U.S. District Courts throughout the country. The proceedings were centralized as part of a Multi-Diustrict Litigation, or MDL. A small group of cases from the MDL are being prepared for early trial dates, known as “bellwether” trials, designed to help the parties find how juries are likely to respond. These trials, currently scheduled to begin between August 2013 and February 2015, may help to influence Pradaxa settlements. Boehringer Ingelheim, listed in the top 20 of all pharmaceutical companies currently working in the industry in the world, introduced Pradaxa in October 2010 as the first member of a new class of anticoagulants. It was promoted as a superior alternative to warfarin for stroke prevention as it was easier to take and required less medical monitoring. Concerns began to emerge about the lack of an effective reversal agent to stop the blood thinning effects of the medication. As Pradaxa’s popularity grew, so did internal bleeding injuries. 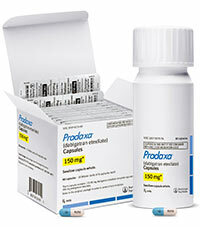 Unlike warfarin, there is no available reversal agent for Pradaxa. Although some studies have shown that the chances of bleeding may be about the same with the two drugs, others indicate that Pradaxa may pose a more serious risk as the hemorrhages are typically harder to stop. If you or a family member has suffered from internal bleeding caused by Pradaxa, you may be entitled to financial compensation for pain and suffering either for your injuries or if you are a family member left behind. Contact us at 800.553.8082, or online here.